War does not help the economy. Increased military spending is one of the least effective ways to create new jobs…It is, after all, an easy and popular way for a president to give himself the look of stimulating economic activity, especially in an era of steep tax cuts favoring the plutocratic class and attacks on domestic spending. The pending U.S. defense budget will send billions of dollars to defense contractors, a move that many say will stimulate economic growth and provide an influx of new jobs. However, research from peace science says this is not the case and that any growth is short-lived and will only affect a small few. There is a popular assumption that war, or even increased military spending, will boost a nation’s economy. True, when a nation goes to war the surge of government investment into war-related industries can lead to short-term economic gains. However, these gains are short-lived, affect only certain, usually isolated, industries (“conflict industry”, “war profiteers”), and are no consolation for the long-term economic cost of war. A study of six major U.S. wars (World War II, the Korean War, the Vietnam War, the Cold War, and the wars in Afghanistan and Iraq) finds the costs of war to negatively affect the national economy, taxes, debt, jobs, investment, and inflation. 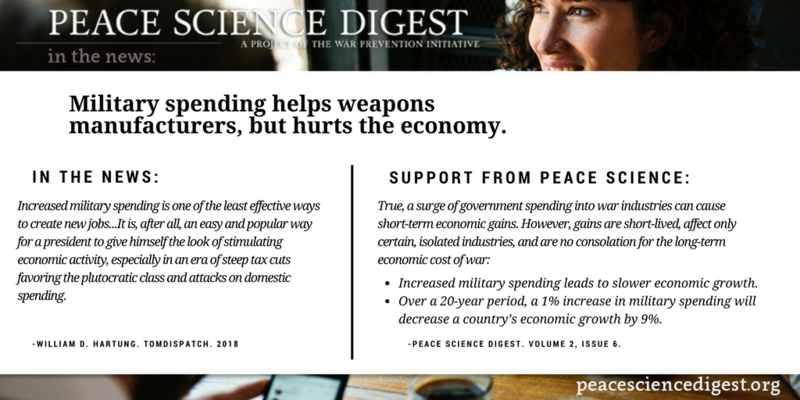 Key findings of the report show that in most wars public debt, inflation, and tax rates increase, consumption and investment decrease, and military spending displaces more productive government investment in high-tech industries, education or infrastructure—all of which severely affect long-term economic growth rates. War Pay: Another Good Year for Weapons Makers Is Guaranteed by William D. Hartung for Transcend Media Service via TomDispatch. 29 Jan 2018.